Department of Orthopedic Surgery and Joint Replacement at Capitol is committed to provide our patients the highest levels of quality and care coupled with human touch when it comes to treatments for musculoskeletal injuries of all kinds. Our physicians have specific training and experience in a broad range of orthopedic specialties such as sports medicine, trauma, joint replacement, pediatrics, oncology, spine, shoulder and elbow, foot and ankle, and hand. We can take you very smoothly through all the stages to treat your problem starting from the correct diagnosis, treatment and rehabilitation. We, at Capitol, can assure you with the best orthopedics treatment in the region with our dedicated and proficient team to handle all kinds of musculoskeletal injuries including inpatient and outpatient surgical care, rehabilitation, orthotics and prosthetics. 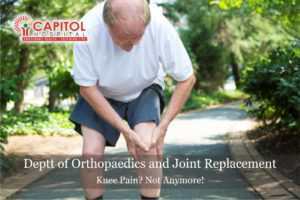 Capitol is a name to reckon with when it comes to building trust with the patients, so whether you are seeking care for a sports-related injury or a condition related to aging, overuse, traumatic accident or for revision surgery, we have an expert who can help improve the quality of your life, range of motion and mobility. Our multidisciplinary approach where our orthopedic experts partner with other specialists — including physical therapists, pain management specialists, radiologists and oncologists — to provide the best quality, personalized and specific treatment plans for our patients at every stage. We work on it each day, which is why we have maintained being the best in Orthopedic surgery and joint replacement in Punjab. Over the past few decades, minimally invasive surgery has become increasingly common across all medical specialties and also in the orthopedics field. New research and technologies have led to improved methods of joint replacement, arthroscopic repairs of sports injuries and microscopic treatment of complex musculoskeletal conditions, among others. Some orthopedic practices are known only for their patient care and results outcomes, while there are others which are known for their innovation. This surgery is outcome of the latter. Minimally invasive surgery is exactly what it sounds like. Traditional surgery often requires a large incision and significant trauma to soft tissue surrounding an injury, minimally invasive surgery attempts to minimize both the size of surgical incisions while achieving the same surgical goal. In orthopedics, this can mean the difference between exposing the entire joint through a large, open incision and using small, targeted incisions to address only the specific problem area. This results in less risk during surgery, less post-operative pain and shorter recovery times. This is achieved usually with the help of an arthroscope, which has a camera mounted on a thin, flexible tube to visualize the interior of the joint and this tool called an arthroscope. Shall I go for minimally invasive orthopedic surgery? For many orthopedic injuries and conditions, traditional surgery methods are still the preferred. The physicians at Capitol hospital are well trained in the full spectrum of treatment options and will guide you in the best possible treatment according to your individual needs. If you have surgery for an orthopedic condition on your mind, schedule an appointment at Capitol right away to learn more about our minimally invasive surgery options.